In 1999 the Board of the VU University approved a proposal of the Nauta Foundation to appoint at each year – or less frequently – a renowned scientist working in the field of research of the department Pharmacochemistry (later renamed as Pharmaceutical Sciences ) for a period of 1-2 weeks as Nauta Professor. This temporary position does not concern a regular professorship – with all consequences – but is meant to allow the Nauta professor to present during the period of appointment lectures and courses as a professor. The appointment will be at the Faculty of Sciences. The courses and lectures will be open for any student or scientist at no charge. During the professorship the Nauta Professor will be requested to present a Nauta Lecture. The costs involved with the appointment and the execution of the programme will be beared by the Nauta Foundation. We list the Nauta Professors and briefly their programmes during the stay at the VU Universtity. Tracy Handel presented her classes for about 60 participants 25 % of them came from institutions/departments from outside the Vrije Universities.The title of the course was Structural biology of Chemokines and their Receptors and dealt especially with ‘Biophysical studies of membrane protein structure and activation’ and ‘Choosing a partner -interaction of chemokines with receptors vs glycosaminoglycans’. The Nauta Lecture What structure tells us about chemokine receptor activation and inhibition was attended by well over 100 participants. The lecture course of prof. Waldmann was presented under the title: ‘The chemistry- Biology Interface: Merging Organic Chemistry and Biology to Inspire Drug discovery‘. The master classes dealt with the following topics: Biology-oriented synthesis; Chemotype-phenotype- target; how to manoeuvre the Academia-Industry Interface? The Nauta lecture was presented with the title “Small molecule modulation of the K-Ras signalling”. The master classes van Nicole Packer dealt with sugars. The title of the Nauta lecture was: “Protein glycosylation: Sugars are not bad at all“. Topics discussed were : Glycomics, the new – omics; Glycoanalysis; Glycomic data analysis; Glycomics: glycan structure meets function. The master classes on Epigenomic and genomic variation and mechanisms influencing drug efficacy and drug toxicity included the topics:Drug metabolism, transport and action. Genetic influence; Adverse drug reactions and methods and in vitro systems for studying mechanisms of drug induced hepatotoxicity; Non coding RNAs and the human hepatic epigenome;Personalized medicine for the future and current and future regulations during drug development and clinical drug treatment. The Nauta lecture had as title “Pharmacogenomic biomarkers for prediction of drug efficacy and adverse drug reactions”. An update and clinical utility. Vertex Pharmaceuticals, San Diego, USA and VU University. The lecture course of Professor Grootenhuis was on ‘Computational Concepts , Strategy and Methods in Drug Discovery’. His Nauta Lecture concerned a case study ‘discovery of CFTR Modulators – Towards a Treatment for Cystic Fibrosis’. The course professor Regnier presented has been on ‘The Science and Application of Separating Proteins’. The Nauta Lecture had as title ‘Proteomics as a Tool in the Search for Disease Markers’. Prof Folkers’s course has been on ‘New Strategies in Drug Design Technologies’. The Nauta Lecture was on the topic ‘Designing the Keys and Engineering the Locks’ – Molecular Design Approaches for Gene Switches. Prof. Milligan’s course was on ‘Modern developments in receptor pharmacology’. 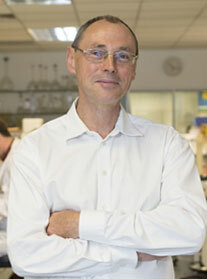 His Nauta Lecture was presented under the title: ‘New fluorescence technologies in drug research’.